With the presence of a large pool of participants, the global thermoplastic polyurethane market is displaying a highly competitive business landscape, finds a new research report by Zion Market Research (ZMR). Polyone Corporation, Bayer Material Science Ag, Huntsman Corporation, BASF SE, Wanhua Chemical Group Co. Ltd., and Lubrizol Corporation are some of the key vendors of thermoplastic polyurethane across the world. These players across thermoplastic polyurethane market are focusing aggressively on innovation, as well as on including advanced technologies in their existing products. 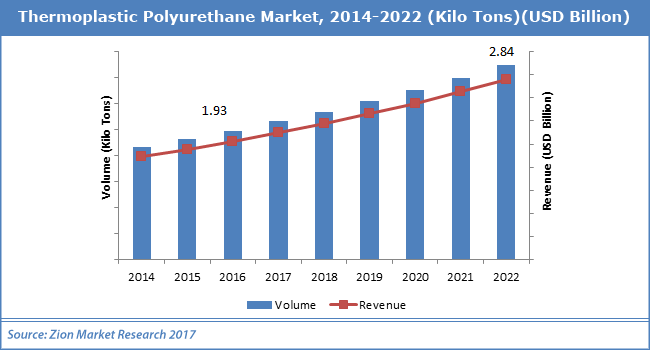 Over the coming years, they are also expected to take up partnerships and mergers and acquisitions as their key strategy for business development, states the thermoplastic polyurethane market study. Citing an instance, in August 2018, BASF SE launched an advanced version of thermoplastic polyurethane technology to enhance the shoe production. The company sources stated that the new technology will help in reducing the shoe shank production costs. Sources cite that the innovative TPU technique will help in reducing processing period by nearly 30%, thereby lowering labor costs. Analysts are of the view that the strategic move will contribute substantially towards the revenue surge for thermoplastic polyurethane market in the forecast timeline. As estimated in this report, the global thermoplastic polyurethane market stood at US$ 1.93 billion in 2016. Witnessing a tremendous rise during the period from 2017 to 2022, the revenue in this thermoplastic polyurethane market is expected to reach US$ 2.84 billion by the end of the forecast period. “Burgeoning demand from automotive, construction, and medical sectors will boost the growth of thermoplastic polyurethane market in the years ahead,” says the author of this study. Apart from this, massive product applications witnessed in extrusion, paints & coatings, injection molding, and adhesives & sealants will further augment the business sphere over the next few years. Escalating global concerns related to ecological damage as a result of the product manufacture & use is predicted to obstruct the thermoplastic polyurethane market surge over the forthcoming years. In addition to this, fluctuations in the raw material costs can hamper the profitability of the business in the ensuing years. Nevertheless, the production of bio-based products is forecast to offer new growth opportunities for the thermoplastic polyurethane market in the near future, thereby normalizing the impact of hindrances on the market, reports the thermoplastic polyurethane market study. Regionally, Asia Pacific has been leading the worldwide thermoplastic polyurethane market and is anticipated to continue on the dominant position in the years to come, states the thermoplastic polyurethane market study. Increase demand for the product from the developing countries in the region and flourishing automotive sector is the main factor behind the dominance of the Asia Pacific thermoplastic polyurethane market. The high number of market players being headquartered in Asia Pacific is another significant factor that is supporting the growth of this regional thermoplastic polyurethane market.